There’s something beautifully and wonderfully magical happening at the New York Theatre Workshop and it has something to do with “star stuff.” And while, generally, when talking about theatre these days “star stuff” would refer to celebrities camping out on the boards for a few months, this star stuff is entirely different and has nothing to do with celebrities. This star stuff is special: it must be protected (as it is here by directors Roger Rees (Lord John Marbury!) and Alex Timbers (of Bloody Bloody Andrew Jackson fame)); it must be handled with care (as it is here by an effective, scrappy and talented cast, led by Adam Chanler-Berat and Celia Keenan-Bolger); and it must not fall into the wrong hands (as it didn’t on Sunday night, when my fellow audience members and I took this delightful journey). The star stuff I’m talking about is the stuff of Peter and the Starcatcher, the new play with music currently in previews at NYTW. 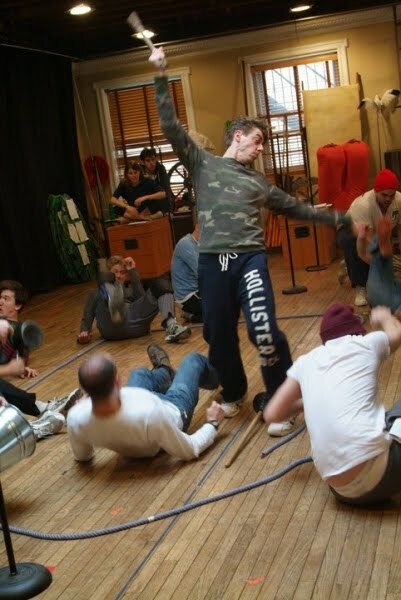 Written by Rick Elice, with music by Wayne Barker and movement by Steven Hoggett (the mastermind behind the thrashing and bashing in American Idiot), Peter and the Starcatcher is based on the eponymous novel written by Dave Barry and Ridley Pearson, which was, of course, inspired by J.M. Barrie’s play Peter Pan, or The Boy Who Would Not Grow Up. (Fun side note: Peter Pan was the first musical I was in (at summer camp, at age nine); I played both Liza, the Darling family maid, and Cecco, one of Captain Hook’s pirates.) As with the haute couture fan-fiction of Gregory Maguire’s Wicked and its musical adaptation, in Peter and the Starcatcher it is really quite interesting to discover Peter Pan’s back story – how he transformed from Boy (an orphan without a name) to Peter Pan, who likes to crow and pal around with Tinker Bell and Tiger Lily. In Peter and the Starcatcher, we meet Molly and her father, Lord Astor, who are both starcatchers. (From what I gathered (and remember) this means they have special communicative powers and are charged with safe guarding Queen Victoria’s (God save her) star stuff.) Setting off on a mission, Lord Astor ends up on one ship, the Wasp, (or maybe the WASP?) and Molly finds herself on the Neverland, a shoddy old ship on which she meets some lost boys, including Boy. The Wasp has been overtaken by pirates, led by Captain Black Stache (who will become Captain Hook), and seeks to plunder the star stuff from the Neverland. Under attack from both pirates and a storm, the Neverland crashes into the island Rundoon, which is itself inhabited by all sorts of characters. Boy and his two pals from the Neverland seek to protect the chest of star stuff they saved from the Neverland and Molly tries to reunite with the boys and her father. Hijinks and hilarity abound throughout, and while that more or less describes the action, the show is really about a boy trying to find himself and his home. Through this insightful look into Boy, we feel a strong sense of sympathy (or maybe empathy, depending upon your situation) for the cocksure Peter Pan. He truly is lost, not just in terms of north, south, east or west. He is an orphan who has been repeatedly let down and lied to by adults, which is why he, on more than one occasion, shouts that he hates grown ups. (Hmm… Maybe that’s why he never wants to grow up?!?) With the help of a starcatcher and her nurturing leadership, Boy makes it through this coming of age story with a new found confidence and plenty to crow about. Now, to be sure, I didn’t love everything about this. There was a bit about celebrity-based star stuff that went on too long for my taste and some of the jokes have no shelf life, but overall, Peter and the Starcatcher captured my attention and imagination. This show captured my imagination mostly because of the sparse staging that challenged said imagination. You remember in my review of Wings I mentioned that writer Arthur Kopit noted about Wings’ non-sets: “the abstraction makes it more real”? So, too, with Peter and the Starcatcher. The play begins with the actors moseying out on stage and chatting nonchalantly with one another. One steps forward and begins addressing the audience and then the others join in, suggesting a rag-tag group of neighborhood kids putting on a show in someone’s backyard on a hot summer day, lemonade close at hand. There isn’t really a structured set like you’d find in most traditional shows. Instead, set designer Donyale Werle (whose great artistry was on display in both the Public and Broadway iterations of Bloody Bloody Andrew Jackson) provided the players with ladders, ropes, a backdrop here or there and various set props. A rope waved by the players became the tumultuous ocean; that same rope, held taut and moved in perfect timing by the players, became a secret passageway. Just like the players would use their imagination to bring to life this abstraction, so did the audience. As an actual grown up, I thrilled over this opportunity to indulge in some good, clean make-believe. My favorite part of the non-set set was the sidedrops, for lack of a better descriptive term, that hung in front of the wings for act two. The second act begins in front of a painted scrim but once that divertissement finishes, the scrim rises and we see a huge space before us. What was once cluttered with “ship” set pieces and all the players is now populated only by a row of cardboard bushes upstage, Boy and the star stuff-containing chest center stage and the beautiful sidedrops at the edge of stages left and right. These multicolored drops ran floor to ceiling (or floor to light grid, as it may have been); they looked like mosaics of blue, green and aquamarine sea glass. Paired with the bare stage, this evoked a luscious tropical getaway, with a great expanse in which you could do whatever or be whomever you want; where anything is possible. In these still, quiet moments, we were treated to a little alone time with Boy, during which we caught glimpses of his transformation. As Boy, Adam Chanler-Berat, who was everyone’s dream boyfriend, Henry, in Next to Normal, brought a similar sweet earnestness to this role, but also shone in the more dramatic or tender moments. (It’s particularly noteworthy that the story and actors flow so naturally here between moments of vaudevillian schtick and true and honest pathos.) Celia Keenan Bolger (good but underused recently in A Small Fire) fully embodied Molly, a plucky, precocious teenager with tenacity and just a little temerity to spare. (Molly (and some of the other characters) also has a penchant for alliteration.) Christian Borle excelled as Captain Black Stache, flinging and contorting his body this way and that, giving himself over with delicious abandon to slapstick and buffoonery. The other players followed suit, appearing game for the challenge of making order out of something that, in lesser hands, could be understated as chaos. 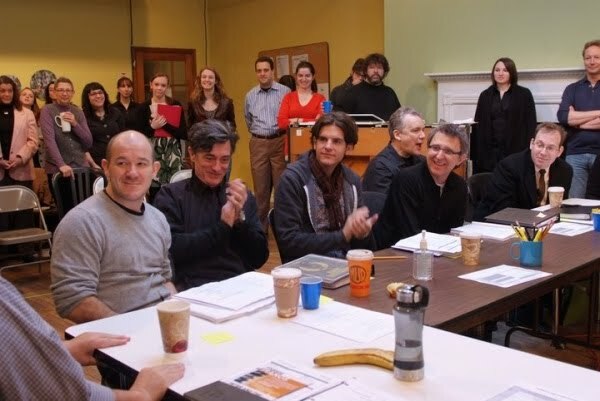 Also rising triumphantly to the order-out-of-chaos challenge are directors Roger Rees and Alex Timbers. I was struck at the smooth flow of Peter and the Starcatcher and the seemingly unified vision presented by these co-directors. I remember having a project in college for which six of us (yes, six!) had to, as a group, direct a brief one act. It was disastrous. I don’t know how they divvied up the directing load, (my friend who accompanied me to the show theorized that Rees focused on the performance and Timbers focused on blocking and physicality), but perhaps the indecipherable nature is to their credit. Kudos to two accomplished directors combining forces to bring to life the heart, schtick and magic that make up the wonderful star stuff of Peter and the Starcatcher. 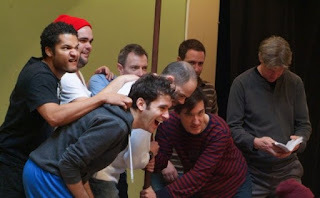 To learn more about Peter and the Starcatcher and to purchase tickets, visit nytw.org.